The Sharp Projector PG-D2510X Manual is available now. For owner of this projector, you can download the manual at Sharp official website. This manual comes in PDF format and available in english language. It's devied into 7 section with Appendix. In the manual contains many reference information especially about setup projector guide. 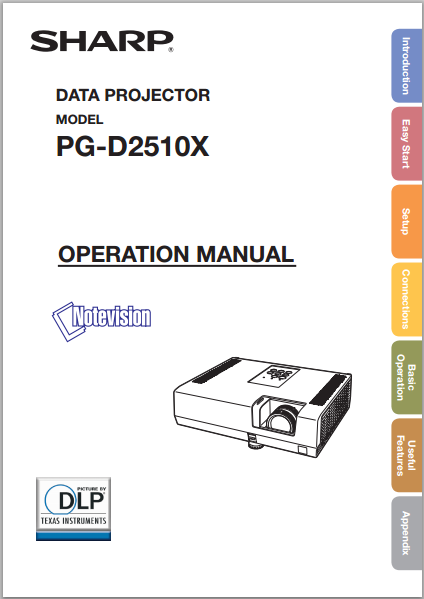 The Sharp PG-D2510X User Manual consist of 73 pages. The owner's manual provided detail reference information such as about projector Part Names and Functions, accessories, Setup and Projection, Setting Up the Projector, Connecting the Projector to Other Equipment like with a computer and the power cord. Then about learn basic operation for example how to Turning the Projector On/Off, Image Projection, Adjusting the Projected Image, Resize Mode, etc. Further, in the Sharp Projector PG-D2510X user manual also discuss about how to Operating with the Remote Control, Using the Spot Function, Freezing a Moving Image, Using the Remote Control as the Wireless Computer Mouse, Using the Menu Screen, Picture Adjustment (“Picture” Menu), Signal Adjustment (“SIG-ADJ” Menu) like Setting the Video System, Setting the Video System and Checking the Input Signal. Other importnt informtion about Setting the FUNCTION Button Operation, DLP LinkTM Invert, System Lock Function, AUTO RESTART FUNCTIOM, Maintenance Indicators, Resetting the Lamp Timer, Troubleshooting, and more.